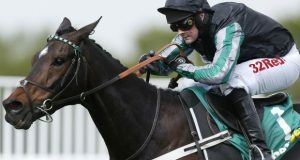 Altior is an Irish bred British trained horse and national hunt specialist. After mixed fortunes in bumper races, he went on to instantly have much more positive results in his first outings over the hurdles, winning the Sharp Novices’ Hurdle and Supreme Novices’ Hurdle. The following season these successes continues with noteable wins in the Henry VIII Novices’ Chase, Arkle Challenge Trophy and the Celebration Chase to name a few. Altior was bred in Ireland by Ethan Simlett and was eventually bought for €60,000 by Highflyer Bloodstock. He soon moved into training with Nicky Henderson courtesy of ownership by Patricia Pugh. The horse certainly has quite some pedigree as his sire High Chaparral was a Derby winner and two times Breeders Cup Turf winner too. His ascent to greatness hasn’t been without its problems though. In the 2017/18 season, breathing problems stalled potential career defining opportunities to run in the Tingle Creek Chase, with an eye on the Queen Mother Champion Chase further down the line. However, before long he was back in the mix, in the Game Spirit Chase against some quality opposition. He wasn’t fazed and won handily, which surely bodes well for the future. It’s a case of stay tuned, the best may well be still to come!